Mol. Cells. Aug 31, 2018; 41(8): 717-723. Chimeric antigen receptor (CAR) T-cell therapy, an emerging immunotherapy, has demonstrated promising clinical results in hematological malignancies including B-cell malignancies. However, accessibility to this transformative medicine is highly limited due to the complex process of manufacturing, limited options for target antigens, and insufficient anti-tumor responses against solid tumors. Advances in gene-editing technologies, such as the development of Zinc Finger Nucleases (ZFNs), Transcription Activator-Like Effector Nucleases (TALENs), and Clustered Regularly Interspaced Short Palindromic Repeats (CRISPR/Cas9), have provided novel engineering strategies to address these limitations. Development of next-generation CAR-T cells using gene-editing technologies would enhance the therapeutic potential of CAR-T cell treatment for both hematologic and solid tumors. Here we summarize the unmet medical needs of current CAR-T cell therapies and gene-editing strategies to resolve these challenges as well as safety concerns of gene-edited CAR-T therapies. First-generation CARs were comprised of a single intracellular signaling domain derived from ITAM-bearing signaling domain of CD3ζ. Because costimulatory signals such as CD28, 4-1BB, or CD278 were not provided in first-generation CAR-T cells, the clinical responses to tumors were largely insufficient (Ma et al., 2002; Park et al., 2007). To enhance the limited anti-tumor efficacy of first-generation CARs, one or two additional costimulatory domains were incorporated into the CD3ζ-based cytoplasmic domain, which resulted in second or third generation CARs. This modification led to a drastic increase in CAR-T cell effector function, persistence, and survival (Moeller et al., 2004; Savoldo et al., 2011). Second-generation CAR-T cells have dramatically improved cancer immunotherapy for multiple blood cancers. The initial success of CAR-T cell therapy was driven mainly by CD19 CAR-T cells, especially in B-cell non-Hodgkin lymphoma (B-NHL), B-cell acute lymphoblastic leukemia (B-ALL), and chronic lymphocytic leukemia (CLL) (Park et al., 2016). Both CD28 and 4-1BB CD19 CAR constructs have consistently led to high anti-tumor responses in the clinic, achieving a 70–94% complete response rate (CR) in B-ALL, 40–75% in CLL, and 57–68% in B-NHL, culminating in the recent approval of two CD19 CAR-T cell products by the U.S. FDA. Despite this significant progress in CD19 CAR-T cell therapies, there are still overarching unmet medical needs in the CAR-T cell therapy field. First, the complex process of autologous CAR-T cell production hinders controllable manufacturing and on-time treatment for patients. Second, CAR-T cells can exhibit fratricide, which narrows options for target antigen choice and restricts the development of CAR-T regimens for diverse cancer types. Lastly, T-cell exhaustion and the immunosuppressive tumor microenvironment (TME) jeopardize CAR-T cell efficacy for various solid tumors. These challenges pose significant barriers, both to the commercialization of current CD19 CAR-T therapies and to extensions of the therapy beyond CD19 CAR-T cells. Gene editing technologies have emerged as promising engineering tools to resolve the limitations mentioned above. The early gene editing technologies, Zinc Finger Nucleases (ZFNs) and Transcription Activator-Like Effector Nucleases (TALENs), are chimeric nucleases composed of a unique DNA-binding domain followed by the FokI DNA-cutting nuclease domain. Whereas ZFNs use multiple zinc fingers, each of which contacts 3–4bp of DNA, as their DNA binding domain, TALENs deploy 1bp-recognizing TAL domains as DNA-binding modules (Gaj et al., 2013). Distinct from these early gene-editing technologies, Clustered Regularly Interspaced Short Palindromic Repeats (CRISPR/Cas9) is a two-component system, composed of a guideRNA and the Cas9 protein. The guideRNA mediates base pairing to complementary target DNA, and Cas9 binds with the guideRNA to induce a double strand break in the target DNA region. Because the CRISPR/Cas9 DNA binding site can be designed to target any sequence of interest by simply altering the guid-eRNA without the need for complex protein engineering, the CRISPR system is highly versatile and is emerging as an efficient alternative to conventional programmable nucleases (Sander and Joung, 2014); as such, it is already being tested in CAR-T cell clinical trials (Table 1). Here, we summarize the recent use of gene-editing technologies to resolve problems associated with CAR-T cell therapy and discuss the potential safety issues and limitations of gene-edited CAR-T cells. There are several barriers to expanding the accessibility of current autologous CAR-T cell therapies. First, quality control for CAR-T cell production is very challenging. The considerable variability of each patient’s starting materials significantly impacts both the feasibility of manufacturing and the therapeutic potential of the product (Singh et al., 2016). Also, because current autologous CAR-T cell therapy requires multi-site manufacturing, highly consolidated sample collection, CAR-T cell manufacturing, and treatment are crucial to ensure critical quality attributes (Levine et al., 2017). Second, the use of CAR-T cell therapy is largely limited by its high price. CD19 CAR-T cell therapy costs $350,000–$500,000, not including health care utilization costs and potential mark-ups. The high price is mainly a result of the laborious processes and expenses required for individualized CAR-T production. Lastly, patients with aggressive disease progression may be unable to withstand the delay required for the complicated manufacturing of an autologous CAR-T regimen. Development of allogeneic CAR-T cell therapy would simplify and resolve some of the challenges associated with the current autologous CAR-T cell therapy manufacturing process. However, the mismatch between major and/or minor histocompatibility antigens from the host and the donor can elicit significant immunological side effects. Therefore, to develop safe and potent allogeneic CAR-T cell therapy, immunological interactions between the host and the donor must be suppressed. First, graft versus host diseases (GvHD) must be prevented, because GvHD observed in allogeneic hematopoietic cell transplantation induces a significant level of fatal responses in clinical studies (Gajewski et al., 2009; Poirot et al., 2015). Because T-cell alloreactivity is dependent on the interaction of T-cell receptors (TCRs) with alloantigens presented by human leukocyte antigens (HLAs) (Amir et al., 2011), TCR-depleted T-cells do not cause GvH responses when infused into HLA-unmatched patients. Among the components of the TCR complex that may be targeted for knockout (KO), including TCR and CD3 isotypes, TCR is considered to be the more promising target because of its distinct regulatory mechanism, known as allelic exclusion (Magklara and Lomvardas, 2013). T-cells are epigenetically regulated to express only one TCR chain, and thereby functional TCR disruption can be achieved by targeting the one functional TCR allele located in euchromatin (Poirot et al., 2015). The beneficial role of TCR KO in evading GvHD has recently been validated in human clinical trials, where TCR-depleted CD19 CAR-T cells successfully circumvented GvHD in two infant patients (Qasim et al., 2017). Host versus graft effect (HvG) is another issue that must be resolved to allow development of allogenic CAR-T cells. One simple approach is to use a lymphodepleting agent to suppress the host immune system during CAR-T cell treatment. However, because these agents also have toxic effects on the infused CAR-T cells, various efforts have been made to render CAR-T cells resistant to the lymphodepleting regimens approved by the FDA. For example, Poirot et al. (2015) have demonstrated that elimination of surface CD52 expression caused T-cells to become resistant to the anti-CD52 antibody, alemtuzumab. Likewise, KO of the deoxycytidine kinase (dCK) gene endowed CAR-T cells with resistance against purine nucleotide analogues such as clofarabine, fludarabine, and cytarabine (Valton et al., 2015). Another approach to suppressing the HvG effect using gene-editing technology is to KO the β2-microglobulin (B2M) gene in T-cells, which can prevent alloantigen presentation by infused T-cells (Ren et al., 2017a). Together, these studies have clearly demonstrated that gene editing has great promise for resolving problems associated with autologous CAR-T cells, although further clinical investigations are needed to validate these approaches. Although CAR-T cell therapies have shown successful clinical outcomes, especially in B-cell malignancies, developing therapeutic CAR-T cells in certain other types of blood cancers is still unachievable due to a lack of proper tumor-specific antigens. Choosing proper target antigens is one of the most important factors determining successful clinical outcomes of CAR-T cell therapy. A good target antigen should meet two prerequisites. First, it should be ubiquitously expressed on all tumor cells. Second, to minimize off-target toxicity of CAR-T cells, the expression of target antigens should be exclusively confined to the tumor cells. In this respect, it is often extremely hard to find proper target antigens for he-matological malignancies because most antigens found on malignant cells are also found on normal T-cells, which can lead to unintended decreases in CAR-T manufacturing yield and loss of potency (Chen et al., 2017; Cooper et al., 2018a; Galetto et al., 2015;Gogishvili et al., 2017; Pinz et al., 2016). In cases of T-cell malignancy, CD4, CD5, and CD7 have been intensively targeted by CAR-based therapies because they are ubiquitously expressed in malignant T-cells. However, many studies have consistently observed fratricidal effects of such targeting. For example, transduction of CAR-T cells targeting CD4, CD5, or CD7 caused depletion of CD4-positive, CD5-positive, or CD7-positive CAR-T cells, respectively, significantly reducing overall CAR-T cell yield (Cooper et al., 2018a; Fleischer et al., 2017; Pinz et al., 2016). Also, continuous interaction of CAR-T cells with target antigens during T-cell expansion significantly reduced their anti-tumor efficacy, presumably due to decrease in CAR expression and T-cell exhaustion (Cooper et al., 2018a; Fleischer et al., 2017). Other studies have deployed alternative immune cells, such as anti-CD5 CAR NK, to detour the self-killing effect of CAR-T cells (Chen et al., 2017). However, considering the strong therapeutic potential of T-cells, a novel engineering strategy is desperately needed to generate fratricide-resistant CAR-T cells. To tackle this problem, Cooper et al. (2018b) and Fleischer et al. (2017) targeted CD5 and CD7 using CRISPR/Cas9, respectively, which successfully suppressed surface expression of CD5 and CD7 in CAR-T cells. They found that such knockouts prevented the self-killing effect of CAR-T cells and potentiated anti-tumor activity (Cooper et al., 2018a; Fleischer et al., 2017; Pinz et al., 2016). Targeting the CS1 antigen for multiple myeloma was also challenging because it is ubiquitously expressed by activated T-cells. To circumvent the potential fratricide effect of anti-CS1 CAR-T cells, Galetto et al. (2015) inactivated CS1 using a TALEN, successfully preventing the loss of CS1-positive CAR-T cells during T-cell expansion. Collectively, disruption of CAR target antigens in T-cells not only prevents fratricide but also increases the anti-tumor efficacy of CAR-T cells by circumventing T-cell exhaustion and CAR down-regulation. Despite their remarkable success in treatment of B-cell malignancies, CAR-T cell therapies against solid tumor have largely failed. The poor anti-tumor response of CAR-T cells against solid tumors results in part from immunosuppressive mechanisms. One such mechanism is the result of prolonged T-cell activation. Studies have shown that although the serial killing capacity CAR-T cells allows effective tumor regression in TME where the tumor cells outnumber CAR-T cells (Jenkins et al., 2015), repetitive tumor encountering can dampen effector functions by reprogramming CAR-T cells toward an exhausted state (Pauken et al., 2016; Schietinger et al., 2016). Conventionally, strong, constitutive promoters such as EF1α or LTR have been used to express CARs. However, strong, unregulated CAR expression can result in accelerated T-cell differentiation and exhaustion (Eyquem et al., 2017). Eyquem et al. demonstrated that incorporation of a CAR gene into the TRAC locus using CRISPR/Cas9 enables transcriptional regulation of CAR similar to TCR during antigen challenging. The resulting optimally controlled CAR expression kinetics successfully sustained T-cell function, circumventing T-cell exhaustion induced by repetitive activation. 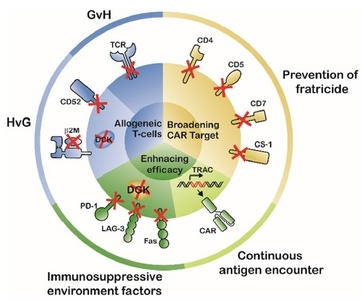 Besides improving T-cell function, integration of the CAR sequence at the TCR locus allowed generation of off-the-shelf CAR-T cells, supporting the versatility of this CAR knock-in approach. CAR-T cell activity in TME can also be compromised by multi-dimensional immunosuppressive mechanisms mediated by PD1, LAG3, and DGK (Nguyen and Ohashi, 2014; Riese et al., 2013; Schadendorf et al., 2015). To resolve this problem, many studies have used checkpoint inhibitors, such as anti-PD1 or anti-LAG3 blockade, to invigorate exhausted CAR-T cells (Liu and Wu, 2017). However, systemic delivery of checkpoint blockade often causes significant adverse clinical effects by increasing autoimmune responses (Naidoo et al., 2015). To avoid both PD-1-mediated immunosuppression and the adverse effects of checkpoint blockade, PD-1 KO has been carried out in T-cells. PD-1 KO improves anti-tumor efficacy of CAR-T in various blood and solid tumor mouse models, presumably by enhancing effector function and survival of T-cells in TME (Menger et al., 2016; Su et al., 2016; Rupp et al., 2017). In a seminal report from University of Pennsylvania, however, it was revealed that PD1 KO T-cells are susceptible to T-cell exhaustion and lack long-term durability, although they showed enhanced short-term proliferation and cytotoxic effects (Odorizzi et al., 2015). Thus, long-term follow-up studies as well as clinical validation are needed to fully understand the therapeutic potential of PD-1 KO. Another promising KO approach is to target TCR inhibitory checkpoints such as DGK. In contrast to the invigoration of the CD28 pathway by PD-1 KO, DGK KO amplifies CD3 downstream signaling, endowing CAR-T cells with resistance to TGF-β and PGE2, inhibitory molecules produced by the TME (Jung et al., 2018; Riese et al., 2013). DGK KO anti-EGFRvIII CAR-T cells successfully enhance tumor infiltration in a glioblastoma xenograft mouse model and improve effector functions in TME, highlighting the therapeutic potential of DGK KO to enhance anti-tumor function of CAR-T cells for solid tumors (Jung et al., 2018). Two other promising KO targets are LAG-3 and FASL. LAG-3 is upregulated in exhausted T-cells in multiple in vivo studies and CAR-T trials (Eyquem et al., 2017; Galon et al., 2017). However, no functional enhancement was observed in in vitro and in vivo experiments when CRISPR/Cas9-mediated LAG-3 KO was carried out in CAR-T cells (Zhang et al., 2017). FasL is present in immunosuppressive TME, promoting apoptosis and terminal differentiation of cytotoxic T cells, which can dampen the anti-tumor efficacy of CAR-T therapy (Klebanoff et al., 2016; Peter et al., 2015). To circumvent FASL-mediated immunosuppression, FAS KO was carried out in T-cells (Ren et al., 2017b). Ren et al. lentivirally delivered a triple guideRNA expression cassette targeting KO of TRAC, PD-1, and FAS. The three guideRNAs, under the control of three different promoters (human U6, mouse U6, and H1) successfully produced triple KO CAR-T cells that showed reduced Activation Induced Cell Death (AICD) and superior expansion capability. These studies support the strong promise of CRISPR/Cas9 as a tool for multiplex genome editing as well as the beneficial role of FAS KO in enhancing T-cell survival. Although gene-editing technologies can be effectively deployed to address the limitations of conventional CAR-T therapy, there exist potential safety risks. One of the major concerns of gene-editing-based therapies is off-target effects, since unintended off-target mutagenesis might ablate tumor-suppressor genes or activate oncogenes. A series of recent studies have reported off-target effects in T-cells. Using an IDLV gene-trapping assay, 10 potential off-target sites were detected in T-cells treated with megaTAL, none of which occurred in an exon region (Osborn et al., 2016). Ren, Liu et al. have observed marginal off-target effects in CAR-T cells electroporated with CRISPR/Cas9 targeting TRAC or TRBC (Ren et al., 2017a), and showed that the use of high-fidelity Cas9 successfully eliminates off-target effects observed with the use of conventional Cas9, while maintaining on-target knockout efficiency (Ren et al., 2017a; Slaymaker et al., 2016). To manage the safety risk of off-target effects, careful selection of target site combined with unbiased off-target assays are required (Tsai et al., 2014). Another safety concern is that multiplex gene editing can lead to translocations between double-strand break sites. Such events were detected at a rate of 1×10−4 –2×10−2 in human T-cells treated with two TALEN mRNAs targeting TRAC and CD52 (Poirot et al., 2015). Although no proliferative advantage was detected in T-cells that underwent translocation, thorough transformation analysis is needed to ensure the safety of gene-edited CAR-T therapies. Lastly, besides the safety risk elicited by gene-editing per se, such as off-target effects and translocation, the altered function of gene-edited CAR-T cell can induce adverse effects in the clinic. For example, upregulated effector functions and hyperproliferative capacity of PD1 KO CAR-T cells can cause severe systemic inflammation, such as cytokine release syndrome (CRS), as observed in multiple CD19-CAR-T studies (Lee et al., 2015; Porter et al., 2015). The long-term safety profile of PD-1 KO CAR-T should be further examined in the clinic (Table 1). In the past, effective genome engineering of primary T-cell was unachievable due to low transfection efficiencies. But recent advances in electroporation tools as well as T-cell activation methods allow highly efficient gene editing in primary T-cells. However, there are still challenges remaining in current T-cell engineering methodology. First, CRISPR/Cas9-mediated gene-editing can induce apoptosis and growth retardation in engineered T-cells, partially attributable to p53-mediated DNA damage and type I interferon responses (Haapaniemi et al., 2018; Kim et al., 2018). Since doubling times of T-cells in the initial expansion phase is 8–11 h, 1–2 days of growth inhibition after electroporation can result in significant decrease in total CAR-T cell yield. Using modified guideRNAs, such as 5’hydroxyl guideRNA or 2’O-methyl guideRNA, has been reported to alleviate the type I interferon immune response, thereby enhancing CAR-T manufacturing (Kim et al., 2018; Osborn et al., 2016). Also, compared to high KO efficiency in primary T-cells (70–90%), the knockin (KI) efficiency is relatively low (Osborn et al., 2016; Poirot et al., 2015; Ren et al., 2017a). Several groups have reported 10–50% CAR KI efficiency using MegaTAL or CRISPR/Cas9 in combination with AAV6-mediated delivery of a homologous recombination donor (Eyquem et al., 2017; Sather et al., 2015). Suppression of the p53 pathway during gene-editing has been shown to increase the rate of homologous recombination in retinal pigment epithelial cells and human pluripotent stem cells, however this approach has not yet been validated in human primary T-cells (Haapaniemi et al., 2018; Ihry et al., 2018). In AUGUST 2017, Tisagenlecleucel, the first genetically engineered cellular drug, was approved by the US FDA with unprecedented clinical outcomes, followed by approval of axi-cabtagene ciloleucel in October. Since then, there has been growing interest in developing next-generation CAR-T cell therapy, including by the use of gene-editing technologies (Table 1, Clinicaltrials.gov). The advent of CRISPR/Cas9 and off-target analysis tools has enabled effective and precise genome-engineering of CAR-T cells, and thereby these technologies are expected to resolve the following three unmet medical needs of current CAR-T cell therapy (Fig. 1). First, gene-editing allows development of off-the-shelf universal CAR-T cells by alleviating GvH and HvG, which can significantly improve CAR-T manufacturing at reduced cost and in shorter time. Second, gene-editing can broaden the range of usable CAR target antigens in blood cancers, otherwise untargetable, by preventing CAR-T fratricide. Third, gene-editing enhances anti-tumor responses by circumventing T-cell hypofunction caused by continuous cell activation and immunosuppressive effects of the TME, which may expand the use of CAR-T cell therapy for solid tumors. Because full understanding of the TME immunosuppressive mechanism is still elusive, there are as yet no clinically validated KO targets for clinical applications. Comprehensive analysis of the TME will reveal robust targets for gene-editing to improve efficacy of CAR-T cells. Although potential safety concerns of gene-editing technologies still need to be resolved, the promising outcomes of gene-edited CAR-T cell therapy may offset the risks. In conclusion, unequivocally, gene-editing technologies, especially CRISPR/Cas9 alongside further understanding of T-cell exhaustion, TME, and clinical outcomes, will ensure the development of more potent CAR-T cell therapies. Mol. Cells.Aug 31, 2018; 41(8): 717-723. Received May 31, 2018; Accepted August 7, 2018. Amir, A.L., van der Steen, D.M., Hagedoorn, R.S., Kester, M.G., van Bergen, C.A., Drijfhout, J.W., de Ru, A.H., Falkenburg, J.H., van Veelen, P.A., and Heemskerk, M.H. (2011). Allo-HLA - Reactive T cells inducing graft-versus-host disease are single peptide specific. Blood. 118, 6733-6742. Chen, K.H., Wada, M., Pinz, K.G., Liu, H., Lin, K.W., Jares, A., Firor, A.E., Shuai, X., Salman, H., and Golightly, M. (2017). Preclinical targeting of aggressive T-cell malignancies using anti-CD5 chimeric antigen receptor. Leukemia. 31, 2151-2160.
Cooper, M.L., Choi, J., Staser, K., Ritchey, J.K., Devenport, J.M., Eckardt, K., Rettig, M.P., Wang, B., Eissenberg, L.G., and Ghobadi, A. (2018a). An “off-the-shelf” fratricide-resistant CAR-T for the treatment of T cell hematologic malignancies. Leukemia. , . Cooper, M.L., Choi, J., Staser, K., Ritchey, J.K., Devenport, J.M., Eckardt, K., Rettig, M.P., Wang, B., Eissenberg, L.G., and Ghobadi, A. (2018b). An “off-the-shelf” fratricide-resistant CAR-T for the treatment of T cell hematologic malignancies. Leukemia. , . Eyquem, J., Mansilla-Soto, J., Giavridis, T., van der Stegen, S.J.C., Hamieh, M., Cunanan, K.M., Odak, A., Gönen, M., and Sadelain, M. (2017). Targeting a CAR to the TRAC locus with CRISPR/Cas9 enhances tumour rejection. Nature. 543, 113. Fleischer, L.C., Raikar, S.S., Moot, R., Knight, K.A., Doering, C.B., and Spencer, H.T. (2017). Engineering CD5-targeted chimeric antigen receptors and edited T cells for the treatment of T-Cell Leukemia. Blood. 130, 1914-1914. Gaj, T., Gersbach, C.A., and Barbas, C.F. (2013). ZFN, TALEN and CRISPR/Cas-based methods for genome engineering. Trends Biotechnol. 31, 397-405. Gajewski, J.L., LeMaistre, C.F., Silver, S.M., Lill, M.C., Selby, G.B., Horowitz, M.M., Rizzo, J.D., Heslop, H.E., Anasetti, C., and Maziarz, R.T. (2009). Impending challenges in the hematopoietic stem cell transplantation physician workforce. Biol Blood Marrow Transplant. 15, 1493-1501. Galetto, R., Chion-Sotinel, I., Gouble, A., and Smith, J. (2015). Bypassing the constraint for chimeric antigen receptor (CAR) development in T-Cells expressing the targeted antigen: improvement of Anti-CS1 CAR activity in allogenic TCRa/CS1 double knockout T-Cells for the treatment of multiple myeloma (MM). Blood. 126, 116-116. Galon, J., Rossi, J., Turcan, S., Danan, C., Locke, F.L., Neelapu, S.S., Miklos, D.B., Bartlett, N.L., Jacobson, C.A., and Braunschweig, I. (2017). Characterization of anti-CD19 chimeric antigen receptor (CAR) T cell-mediated tumor microenvironment immune gene profile in a multicenter trial (ZUMA-1) with axicabtagene ciloleucel (axi-cel, KTE-C19). J Clin Oncol. 35, 3025-3025. Gogishvili, T., Danhof, S., Prommersberger, S., Rydzek, J., Schreder, M., Brede, C., Einsele, H., and Hudecek, M. (2017). SLAMF7-CAR T cells eliminate myeloma and confer selective fratricide of SLAMF7 normal lymphocytes. Blood. 130, 2838-2847. Haapaniemi, E., Botla, S., Persson, J., Schmierer, B., and Taipale, J. (2018). CRISPR–Cas9 genome editing induces a p53-mediated DNA damage response. Nat Med. 24, 927-930. Ihry, R.J., Worringer, K.A., Salick, M.R., Frias, E., Ho, D., Theriault, K., Kommineni, S., Chen, J., Sondey, M., and Ye, C. (2018). p53 inhibits CRISPR–Cas9 engineering in human pluripotent stem cells. Nat Med. 24, 939-946. Jenkins, M., Davenport, A., Cross, R., Yong, C., Ritchie, D.S., Trapani, J., Kershaw, M., Darcy, P., and Neeson, P. (2015). CAR-T Cells are serial killers of tumor cells. Blood. 126, 3088-3088. Jung, I.-Y., Kim, Y.-Y., Yu, H.-S., Lee, M., Kim, S., and Lee, J. (2018). CRISPR/Cas9-mediated knockout of DGK improves anti-tumor activities of human T cells. Cancer Res. , . Kim, S., Koo, T., Jee, H.G., Cho, H.Y., Lee, G., Lim, D.G., Shin, H.S., and Kim, J.S. (2018). CRISPR RNAs trigger innate immune responses in human cells. Genome Res. , . Klebanoff, C.A., Scott, C.D., Leonardi, A.J., Yamamoto, T.N., Cruz, A.C., Ouyang, C., Ramaswamy, M., Roychoudhuri, R., Ji, Y., and Eil, R.L. (2016). Memory T cell–driven differentiation of naive cells impairs adoptive immunotherapy. J Clin Invest. 126, 318-334. Lee, D.W., Kochenderfer, J.N., Stetler-Stevenson, M., Cui, Y.K., Delbrook, C., Feldman, S.A., Fry, T.J., Orentas, R., Sabatino, M., and Shah, N.N. (2015). T cells expressing CD19 chimeric antigen receptors for acute lymphoblastic leukaemia in children and young adults: a phase 1 dose-escalation trial. The Lancet. 385, 517-528. Levine, B.L., Miskin, J., Wonnacott, K., and Keir, C. (2017). Global manufacturing of CAR T cell therapy. Mol Ther Methods Clin Dev. 4, 92-101. Liu, S.Y., and Wu, Y.L. (2017). Ongoing clinical trials of PD-1 and PD-L1 inhibitors for lung cancer in China. J Hematol Oncol. 10, 136. Ma, Q., Gonzalo-Daganzo, R.M., and Junghans, R.P. (2002). Genetically engineered T cells as adoptive immunotherapy of cancer. Cancer Chemother Biol Response Modif. 20, 315-341. Magklara, A., and Lomvardas, S. (2013). Stochastic gene expression in mammals: lessons from olfaction. Trends Cell Biol. 23, 449-456. Menger, L., Sledzinska, A., Bergerhoff, K., Vargas, F.A., Smith, J., Poirot, L., Pule, M., Herrero, J., Peggs, K.S., and Quezada, S.A. (2016). TALEN-mediated inactivation of PD-1 in tumor-reactive lymphocytes promotes intratumoral T-cell persistence and rejection of established tumors. Cancer Res. 76, 2087-2093. Moeller, M., Haynes, N.M., Trapani, J.A., Teng, M.W., Jackson, J.T., Tanner, J.E., Cerutti, L., Jane, S.M., Kershaw, M.H., and Smyth, M.J. (2004). A functional role for CD28 costimulation in tumor recognition by single-chain receptor-modified T cells. Cancer Gene Ther. 11, 371-379. Naidoo, J., Page, D.B., Li, B.T., Connell, L.C., Schindler, K., Lacouture, M.E., Postow, M.A., and Wolchok, J.D. (2015). Toxicities of the anti-PD-1 and anti-PD-L1 immune checkpoint antibodies. Ann Oncol. 26, 2375-2391. Nguyen, L.T., and Ohashi, P.S. (2014). Clinical blockade of PD1 and LAG3 — potential mechanisms of action. Nat Rev Immunol. 15, 45. Odorizzi, P.M., Pauken, K.E., Paley, M.A., Sharpe, A., and Wherry, E.J. (2015). Genetic absence of PD-1 promotes accumulation of terminally differentiated exhausted CD8 T cells. J Exp Med. 212, 1125-1137. Osborn, M.J., Webber, B.R., Knipping, F., Lonetree, C.-l., Tennis, N., DeFeo, A.P., McElroy, A.N., Starker, C.G., Lee, C., and Merkel, S. (2016). Evaluation of TCR gene editing achieved by TALENs, CRISPR/Cas9, and megaTAL nucleases. Mol Ther. 24, 570-581. Park, J.R., Digiusto, D.L., Slovak, M., Wright, C., Naranjo, A., Wagner, J., Meechoovet, H.B., Bautista, C., Chang, W.C., and Ostberg, J.R. (2007). Adoptive transfer of chimeric antigen receptor re-directed cytolytic T lymphocyte clones in patients with neuroblastoma. Mol Ther. 15, 825-833. Park, J.H., Geyer, M.B., and Brentjens, R.J. (2016). CD19-targeted CAR T-cell therapeutics for hematologic malignancies: interpreting clinical outcomes to date. Blood. 127, 3312-3320. Pauken, K.E., Sammons, M.A., Odorizzi, P.M., Manne, S., Godec, J., Khan, O., Drake, A.M., Chen, Z., Sen, D.R., and Kurachi, M. (2016). Epigenetic stability of exhausted T cells limits durability of reinvigoration by PD-1 blockade. Science. 354, 1160-1165. Peter, M.E., Hadji, A., Murmann, A.E., Brockway, S., Putzbach, W., Pattanayak, A., and Ceppi, P. (2015). The role of CD95 and CD95 ligand in cancer. Cell Death Differ. 22, 549. Pinz, K., Liu, H., Golightly, M., Jares, A., Lan, F., Zieve, G.W., Hagag, N., Schuster, M., Firor, A.E., and Jiang, X. (2016). Preclinical targeting of human T-cell malignancies using CD4-specific chimeric antigen receptor (CAR)-engineered T cells. Leukemia. 30, 701-707. Poirot, L., Philip, B., Schiffer-Mannioui, C., Le Clerre, D., Chion-Sotinel, I., Derniame, S., Bas, C., Potrel, P., Lemaire, L., and Duclert, A. (2015). Multiplex genome edited T-cell manufacturing platform for “off-the-shelf” adoptive T-cell immunotherapies. Cancer Res. 75, 3853-3864. Porter, D.L., Hwang, W.-T., Frey, N.V., Lacey, S.F., Shaw, P.A., Loren, A.W., Bagg, A., Marcucci, K.T., Shen, A., and Gonzalez, V. (2015). Chimeric antigen receptor T cells persist and induce sustained remissions in relapsed refractory chronic lymphocytic leukemia. Sci Transl Med. 7, 303ra139-303ra139. Qasim, W., Zhan, H., Samarasinghe, S., Adams, S., Amrolia, P., Stafford, S., Butler, K., Rivat, C., Wright, G., and Somana, K. (2017). Molecular remission of infant B-ALL after infusion of universal TALEN gene-edited CAR T cells. Sci Transl Med. 9, . Ren, J., Liu, X., Fang, C., Jiang, S., June, C.H., and Zhao, Y. (2017a). Multiplex Genome Editing to Generate Universal CAR T Cells Resistant to PD1 Inhibition. Clin Cancer Res. 23, 2255-2266. Ren, J., Zhang, X., Liu, X., Fang, C., Jiang, S., June, C.H., and Zhao, Y. (2017b). A versatile system for rapid multiplex genome-edited CAR T cell generation. Oncotarget. 8, 17002-17011. Riese, M.J., Wang, L.C., Moon, E.K., Joshi, R.P., Ranganathan, A., June, C.H., Koretzky, G.A., and Albelda, S.M. (2013). Enhanced effector responses in activated CD8+ T cells deficient in diacylglycerol kinases. Cancer Res. 73, 3566-3577. Rupp, L.J., Schumann, K., Roybal, K.T., Gate, R.E., Ye, C.J., Lim, W.A., and Marson, A. (2017). CRISPR/Cas9-mediated PD-1 disruption enhances anti-tumor efficacy of human chimeric antigen receptor T cells. Sci Rep. 7, 737. Sander, J.D., and Joung, J.K. (2014). CRISPR-Cas systems for editing, regulating and targeting genomes. Nat Biotechnol. 32, 347. Sather, B.D., Romano Ibarra, G.S., Sommer, K., Curinga, G., Hale, M., Khan, I.F., Singh, S., Song, Y., Gwiazda, K., and Sahni, J. (2015). Efficient modification of CCR5 in primary human hematopoietic cells using a megaTAL nuclease and AAV donor template. Sci Transl Med. 7, 307ra156. Savoldo, B., Ramos, C.A., Liu, E., Mims, M.P., Keating, M.J., Carrum, G., Kamble, R.T., Bollard, C.M., Gee, A.P., and Mei, Z. (2011). CD28 costimulation improves expansion and persistence of chimeric antigen receptor-modified T cells in lymphoma patients. J Clin Invest. 121, 1822-1826. Schadendorf, D., Hodi, F.S., Robert, C., Weber, J.S., Margolin, K., Hamid, O., Patt, D., Chen, T.-T., Berman, D.M., and Wolchok, J.D. (2015). Pooled analysis of long-term survival data from phase II and phase III trials of Ipilimumab in unresectable or metastatic melanoma. J Clin Oncol. 33, 1889-1894. Schietinger, A., Philip, M., Krisnawan, V.E., Chiu, E.Y., Delrow, J.J., Basom, R.S., Lauer, P., Brockstedt, D.G., Knoblaugh, S.E., and Hämmerling, G.J. (2016). Tumor-specific T cell dysfunction is a dynamic antigen-driven differentiation program initiated early during tumorigenesis. Immunity. 45, 389-401. Singh, N., Perazzelli, J., Grupp, S.A., and Barrett, D.M. (2016). Early memory phenotypes drive T cell proliferation in patients with pediatric malignancies. Sci Transl Med. 8, 320ra323-320ra323. Slaymaker, I.M., Gao, L., Zetsche, B., Scott, D.A., Yan, W.X., and Zhang, F. (2016). Rationally engineered Cas9 nucleases with improved specificity. Science. 351, 84-88. Su, S., Hu, B., Shao, J., Shen, B., Du, J., Du, Y., Zhou, J., Yu, L., Zhang, L., and Chen, F. (2016). CRISPR-Cas9 mediated efficient PD-1 disruption on human primary T cells from cancer patients. Sci Rep. 6, 20070. Tsai, S.Q., Zheng, Z., Nguyen, N.T., Liebers, M., Topkar, V.V., Thapar, V., Wyvekens, N., Khayter, C., Iafrate, A.J., and Le, L.P. (2014). GUIDE-seq enables genome-wide profiling of off-target cleavage by CRISPR-Cas nucleases. NatBiotechnol. 33, 187. Valton, J., Guyot, V., Marechal, A., Filhol, J.-M., Juillerat, A., Duclert, A., Duchateau, P., and Poirot, L. (2015). A Multidrug-resistant Engineered CAR T Cell for Allogeneic Combination Immunotherapy. Mol Ther. 23, 1507-1518. Zhang, Y., Zhang, X., Cheng, C., Mu, W., Liu, X., Li, N., Wei, X., Liu, X., Xia, C., and Wang, H. (2017). CRISPR-Cas9 mediated LAG-3 disruption in CAR-T cells. Front Med. 11, 554-562. 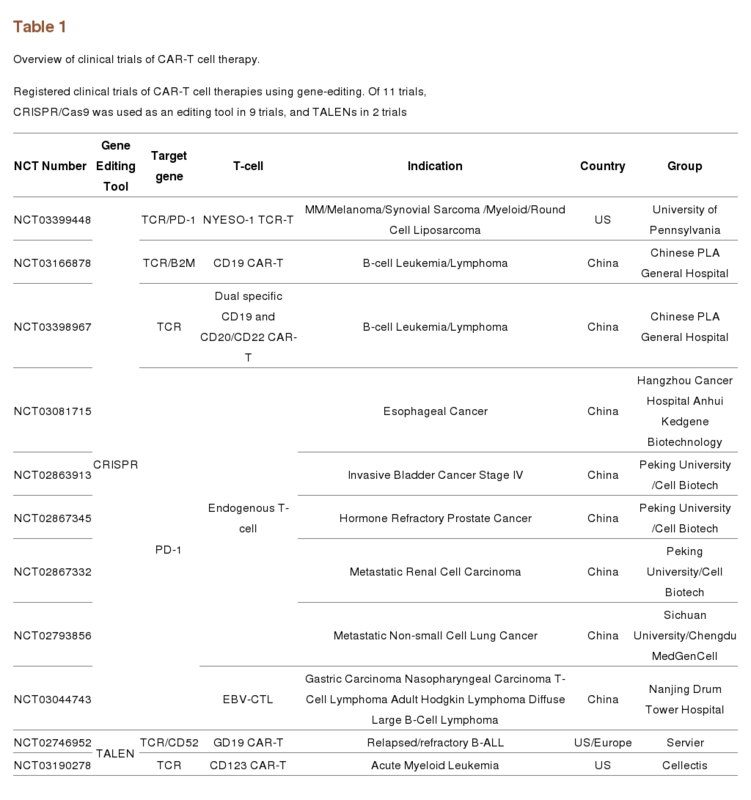 Overview of clinical trials of CAR-T cell therapy.